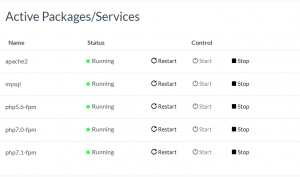 In this tutorial, we will show you how to manage your installed packages/services. Login to your SetupServer.io Account and select the Server from the dashboard for which you want to manage services. After that, click on “Services” tab from the right side vertical navigation bar. 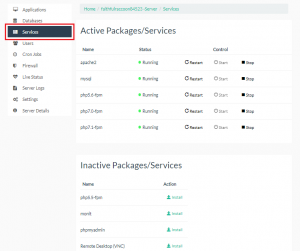 All the installed Packages/Services will be displayed in Active Packages/Services directory and all the other will be displayed under Inactive Packages/Services. 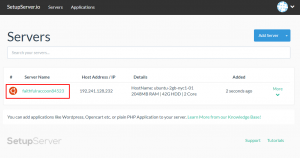 At the time of “Fresh Install”, default services will automatically get installed on the server like MySQL, PHP version you installed, Apache2 (if LAMP stack is installed) and Nginx (if LEMP Stack is installed). A user can manage services by single click interface, i.e. 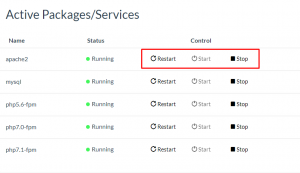 if you want to restart certain service just click on “Restart” button on the corresponding row for that service and also you can “Start” or “Stop” the active services anytime. You can add new packages like Monit, php5.5-fpm, and PHPMyAdmin as per your convenience. For adding new services please visit our documentation “Add Packages/Services to Server“.